The Golden Age of Shopping: Downtown Newark ~ The History Girl! In a time before malls and regional shopping centers filled New Jersey's landscape, Newark was a prime shopping destination. Imagine hopping into the family car, on a bus, or train in the 1940s or 1950s and spending the day in Newark shopping, eating at restaurants, or watching a show. Crowds on busy streets passed by stores with large plate-glass windows displaying the newest fashions and most modern conveniences. 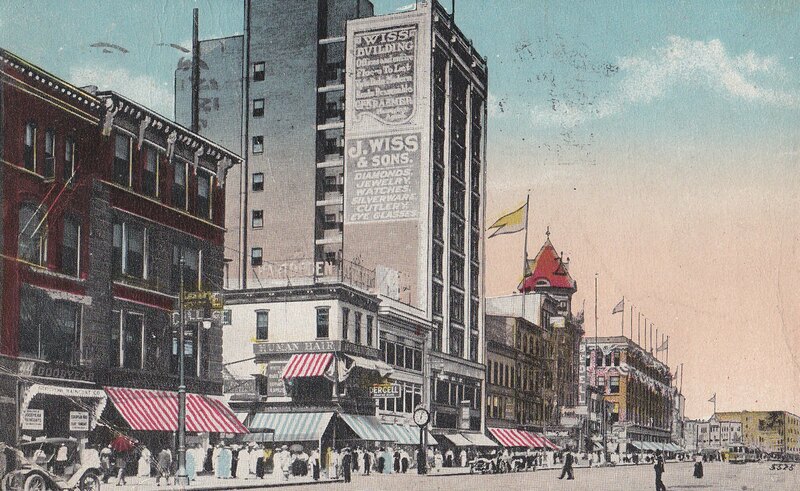 While the intersection of Broad and Market streets, known as the Four Corners, was Newark’s commercial hub, just a few blocks away, the area around Military Park presented a different kind of experience It was known as "Ladies’ Mile" for the stores that catered to the elegant ladies who bought the finest objects in America. This was the Golden Age in Newark. But as quickly as it came, it ended by the 1970s, when new indoor malls and big-box stores began to spring up in suburban locations such as Menlo Park and Bergen County. These behemoths of commercialization in Newark still stand today, battered by neglect, but still proudly displaying the names of the stores that were synonymous with downtown Newark. Yet, all good things must come to an end, and for the iconic buildings on two blocks of Broad Street between Cedar Street and New Street, their time has come. This two block area of Broad Street, between Cedar and New Streets, filled with small shops and businesses, was a prestigious residential area in the eighteenth and nineteenth centuries, with mansions lining the streets. Gradually, the grand homes were replaced by shops and stores in the late nineteenth and early twentieth centuries, as businesses attempted to move closer toward the rapidly expanding northern portion of Newark where the wealthier were settling. Broad Street became the most prestigious shopping area of the business district and contained the largest concentration of department stores in Newark, including Hahne and Company, Plaut's, Kresge's, and Goerke's. The McCrory's building on the corner of Cedar and Broad Streets, is a four-story, eleven bay, brick, rectangular building constructed in phases between 1892 and 1900. The Art Moderne, terra-cotta clad exterior that we see today on the front of the building was added in the late 1940s. The original brick, circa 1892, is still visible on the Cedar Street side, but all of the windows have been boarded up. A large sign, stylistic of the Art Moderne era, was over three stories in height and remains affixed to the building. The first floor also had a marquee that extended across the front and around the corner. The William V. Snyder Dry Goods Store, circa 1910. The McCrory's building began its life about 1892 as the William V. Snyder Company Dry Goods Store. The store was built in a classical style with double-hung windows across the front in evenly placed fenestration. The top of the building had a pressed tin cornice and above the first floor windows was an entablature with a canopy. 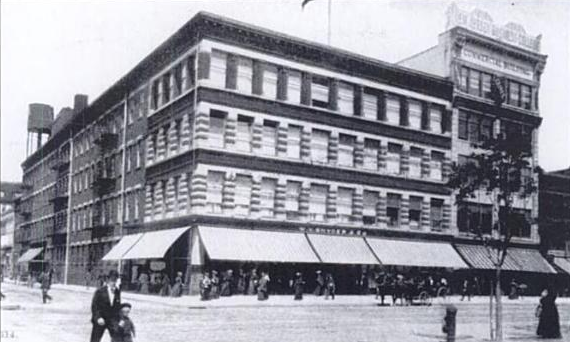 The William V. Snyder Dry Goods Store became part of Goerke's Department Store around 1923. In the early 1940s, a new tenant, McCrory's, opened in the space. Shortly after opening, McCrory's modernized the building's exterior in the Art Moderne style. McCrory's offered a restaurant on the second floor and even had its own subway platform. In 1927, Kresege's, the department store on the opposite corner, opened a platform in Newark's subway at its basement level, allowing customers to come in directly from the subway. The station was opened in January on the inbound side. The only access was through the store. Kresge's was a general store similar to Woolworth's. The company now operates the Kmart chain. The McCrory's store on the opposite side of Cedar Street followed suit and built a platform on the outbound side in August 1929, directly opposite Kresge's. Again, the only access was through the store. Since it was on the outbound side, this platform was used mainly as a store exit. The platforms drew people into the stores just to change cars between routes in the tunnel and routes out on Broad Street. The subway lasted until 1938, when the rails were paved over and buses operated in the subway until 1966, however historians believe that the platforms closed much earlier than 1966. Today, the McCrory's platform has been sealed, but the Kresge platform is still visible underground. McCrory's continued to operate in Newark until the mid-1970s. The former McCrory's and S. Klein on the Square, 2013. S. Klein, On The Square is an eight-story, five bay, skeletal steel frame structure with brick and terra cotta cladding. Newark architect William E. Lehman designed this building in 1923 as part of the Goerke's Department Store complex. On December 2, 1937, it became Hearn's Department Store. James A. Hearn & Son, founded in 1827, at one point had been Macy's main rival in New York. Over the years, at least three additions were made to the rear of the building, resulting in a very narrow, but long building that forms an "L" at its rear along Halsey Street. "Klein's is not a pretty place. Its floors are bare. There are no saleswomen. Customers must select dresses themselves from the crude iron racks, try them on in crowded public dressing rooms. Klein's does not advertise—except to keep customers away on holidays when the store is closed." S. Klein's operated its Newark store until 1976 and has remained vacant since. 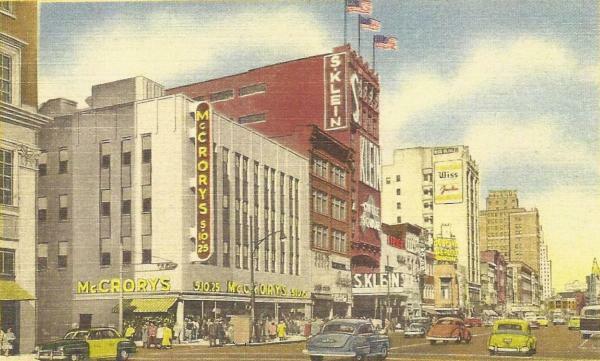 Broad Street circa 1950s, showing the S. Klein Store and the new Art Moderne facade on McCrory's. The Schrafft's Building is a three-story, five bay, brick, Colonial Revival-influenced commercial building. It is located on the corner of Broad and West Park Streets. Constructed in 1933, Schrafft's was a chain of high-volume, moderately-priced New York restaurants connected to the Schrafft's food and candy business of Boston. They offered large, pleasant dining rooms "in the better areas," which often attracted women who were in these areas for shopping, such as "Ladies Mile" in Newark. Women out for lunch represented the bulk of the customers at Schrafft's restaurants. Schrafft's was one of the first restaurant chains to perfect a "signature style" of interior decor including walnut woodwork and early American period furniture. Most of the Schafft's chain closed by the late 1970s, including the Newark location. The building was vacant for a number of years after its closing. The upper floors have remained vacant since at least 1985 and sometime after 1985 the first floor reopened as a retail operation called "Beauty in Everyone." The Wiss Building is a ten-story, three bay, "L" shaped building constructed in 1910. It was built for the Wiss Company, a Newark-based manufacturer of scissors, shears, and retail jewelry. At the time of its construction, it was considered one of the tallest buildings in Newark. Its front facade was constructed of limestone, glazed terra cotta, marble, and pressed metal. Originally, the first floor boasted one large storefront with offices above. Over time, the first floor was subdivided and the marble front removed, replaced by a variety of commercial signs. Architect Henry Baechlin, who also helped design Symphony Hall, designed the Wisss Building. The ground floor housed the Wiss Jewelry Store, the retail division of the scissor and shear manufacturer. The 1935 and 1940 Newark City Directories list the Lee Anna Hoisery Shop and the Broad Street Linen Shops. In addition to its scissors and shears, the store sold china, watches, diamonds, and silverware. The company commissioned their own line of Lenox and China under the name Wiss and Sons. The store's motto was "a diamond for every purse." Smaller retail establishments and professionals rented the upper floors. The Wiss Building, circa 1920. The Wiss Company was founded in 1848 by Jacob Wiss. The Wiss' products were high-quality and sold to the U.S. Government during the Civil War and both World Wars. The Wiss factory on Littleton Avenue in Newark opened in 1887. By 1914, Wiss acquired the manufacturing facilities of a competitor and became the world's largest producer of fine scissors and shears. The company was purchased in 1976 and the manufacturing facilities left Newark a few years later. The Wiss Building was owned by the family until 1956 when it was sold to a New York real estate developer. The store remained in the building under a long-term lease. It is unknown when the store finally closed, but it is possible that it remained open until the company was sold in 1976. The last historic building on Broad Street to meet the wrecking ball is an Art Moderne Building built circa 1930. The building is a three-story, single bay building with a curved corner entrance. The exterior of the building is limestone and is characterized with an organic chevron-ornamented frieze and an overall horizontal emphasis. This sleek building housed Loft's Candy Store in 1935 and other retail stores on the upper floors. In the 1940s, the first floor housed Jordan's Ladies Wear. In the 1970s, the building was substantially renovated to house King's Sea Food and more recently Planet Wings. These later renovations gutted the building of its historical integrity. The Broad Street streetscape has changed numerous times since the first commercial buildings were built in the late 1800s. As time passed, uses evolved and the size and configuration of the buildings made them undesirable for new tenants. Newark as a whole suffered from the growth of suburban shopping centers in the mid-1960s and 1970s. Once suburban sprawl took root, the once-popular department stores of Newark lost their allure. In addition, soaring crime rates and the rise of undesirables in Newark contributed toward this decline. Despite attempts to renovate and rejuvenate the sites, only the first floor retail shops remained viable and in some cases, the buildings never reopened. Some buildings were more fortunate. Kresge's was renovated and now houses retail and offices. Others, such as Hanhe's & Company, sit idly, waiting to saved. By late winter 2013, the two block area of Broad Street, between Cedar and New Streets, will be reduced to rubble. In their place will rise a modern glass and steel office high-rise, the future headquarters of the Prudential Insurance Company, which has called Newark home since 1875. Perhaps this new development will spur the preservation and rehabilitation of the remaining stores and shops that once made Newark a grand city. This article focuses on the buildings along Broad Street that are being torn down as part of the construction of a new office high-rise. Each of these buildings have a unique history and I wanted to document that. To include all of Newark's other department stores would be a rather lengthy article. This leaves open the possibility for a future article on the stores on Market Street that were not included this time around. I am a real estate appraiser and I appraised the Schrafft's building about six years ago. The second floor had the remains of the original decor, but had been damaged by years of neglect. I always wondered what it was, maybe a restaurant or club but I never put much research into it. I have one or two photos if you're interested. Thanks, History Girl for timely coverage on most of the buildings along Broad Street bet. Cedar and New streets. I remember McCory, S. Klein, Schrafft's and (not covered)Lowe's movie theater. My mother was a clerk at a nearby religious store 1968-72 whose duties included keeping the storefront boa constrictor. She regularly bought mice from McCory's pet section to feed the boa. McCory's mice sized cardboard pet carriers bore the slogan: I'm Going to a New Home! Schrafft's was a chain or restaurants with candy and baked goods departments. The front of the second floor was a dining room, painted an antique white with (I think) gold trim. Behind that room was a Men's Grill, a room for businessmen to dine. I recall a staircase and an elevator to the second floor. The front part of the first floor featured counter service on the left and the candy/baked goods etc. on the right. The walls were wood-paneled (real wood! )and had Colonial wall sconces. Behind that section of the building was another sit-down dining room which was formal, like the one upstairs. It was also done in an off-white, with built-in mirrors. Arched window dividers separated it from the counter/store section. I remember a dumb waiter that brought food up to the counter, and there was a kitchen behind the first floor dining room. Spent many weekends with my aunt and uncle in Newark as a child. My uncle worked in Bamberger's, my aunt at Bell Telephone Co as a service rep. Loved going to all those stores with my aunt back in the day. Side note: my uncle was a Heinisch, the Heinisch company was the "competitor" bought out by Wiss. Just a couple of notes about the Wiss Building. Like many retailers downtown, Wiss Jewelers saw their business tumble after the riots of 1967, and by the early 1970's the store warned that it may leave downtown. In December of 1972 a fire destroyed a portion of their store, a single story china/crystal and gift showroom that fronted on West Park Street. The entire store remained closed after the fire, and in January '73 they made it official that they would not reopen downtown. A beautiful street clock that stood opposite their Broad Street entrance was moved to the front of their store at the then, outdoor Mall at Short Hills. The Hahne's building is being renovated to contain 180 apartments, office space, a Whole Foods grocery store, and several other retail stores. See my posts on the Wired New York forum. I love this article. I was there in the 50s, going by bus to get winter clothes before school started. It could be 90 in Sept, but you had to wear corduroy, no summer cotton would do. And no white shoes after Labor Day. Then in 1964 I started at Rutgers, before all those new campus buildings were built. I walked all over the place getting from class to class. Then after graduation, I worked at Prudential for many years, left and returned to finally retire from Pru. Ah, the memories! I grew up in Orange in the 1950's. In those days very few stores were open after 6pm. Gradually the practice developed that each town would be open one night per week. Orange on Monday, Bloomfield on Tuesday, etc., etc. However, NO OTHER TOWN would bother to be open on Wednesdays, because that was the night that Newark stores were open! We took the Park Avenue bus to the City Subway, and then rode downtown. And yes, there were no buses in the tunnels by the early 1950's, just the #7 City Subway. Thanks for the memories! I worked at McCory's!!!! Wow I am not so young anymore. I worked there for 2 years when I was 16 and in high school. I was the "Contact girl" because I measured the Contact paper people used to put on walls or anywhere else. It was located in the fabric department which had rows and rows of material. Mr. Gilbert was the manager.. sweet older man. when the assistant manager came around we girls would put fabric in front of us for folding because he was a bit of a perv. Poor Miss. Rose got caught stealing from that very old fashion cash register.. It was old back then and would be an antique now. As a teenager I never notice what the outside looked like. I made $2.00 an hour. I am still best friends with the girl I worked with there. Memories! I have Goerke's hats in the boxes and was looking for more info and you were the first of many that was at least supplied some info. Very interesting info about buildings that I had been in often, back in the day. My late Mom worked at Woolworth's, Klein's, McCory' s & Hahnes in the 60's 70's. I particularly remember going downtown around the 'Xmas season when that area of Broad St was alive & irresistible to a young kid like myself. As a teen, I remember the Adams Theater on Broad also. Then, as an Art's High student, I was through downtown pretty much 5 days a week. Thanks for the memories.